When Lydia Davis writes short stories, you take notice. You observe them and linger in their bitter or sweet after-thought. You also get confused. You wonder what her stories are about. As a reader, you also want to give up some times. You do not want to turn the next page. That is what you feel like and you cannot help it. You keep the book aside and after some time you get back to the book and then it hits on you, what you have been missing out on. And then the true beauty of her writing hits you. 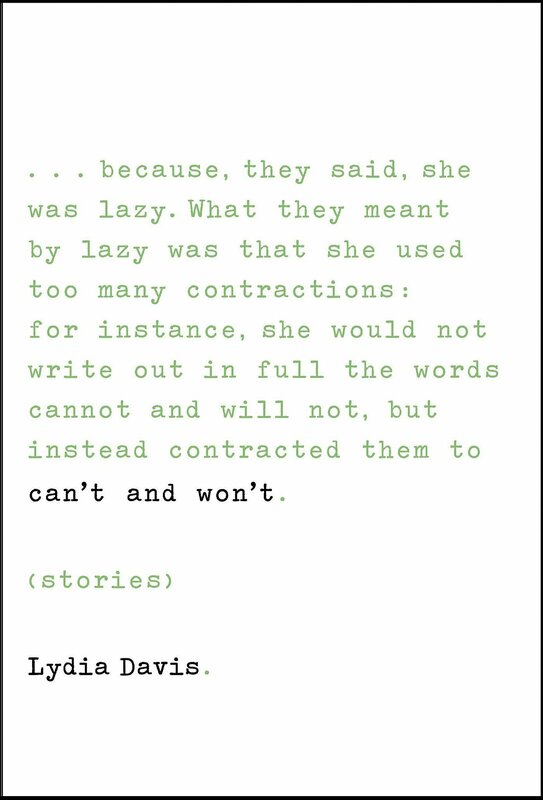 Lydia Davis’s new collection of stories, “Can’t and Won’t” is a fantastic collection of vignettes, of short stories and of really long stories. At some point, I did not have it in me to soldier on, and yet I did. I think most of it also had to do with the fact that I had read Davis’s stories earlier. So my recommendation would be that to read some of her works online and then you will absolutely love what she writes and the way she expresses herself. “Can’t and Won’t” is a collection that makes you ponder, makes you doubt, leaves you confused, perplexed and at the same time wrenches your heart with the most basic observations about life and living. Most of these stories are either retellings of her dreams, or related to Flaubert’s life (which are brilliantly reconstructed) or tales that are about painful memories and indecision and wanting to deal with life. The stories are sometimes complex, sometimes simple and sometimes just make you want to drop everything else and think about life. “Can’t and Won’t” is expansive. It is a collection that challenges you, delivered in well prose and above all conjures a sense of wonder and delight, with every turn of the page. This entry was posted in Authors I Love, Books, Farrar Straus and Giroux, Lydia Davis, Review, short stories and tagged Can't and Won't, Farrar, lydia davis, macmillan, short stories, Straus and Giroux on July 31, 2014 by thehungryreader.